Let me just start by saying that this is my first review in a while. A lot has been going on in my life, professionally and personally, and unfortunately writing toy reviews has fallen mostly by the wayside. However, sometimes there are figures that are so bad or so good that you just have to tell someone and the words come flooding out. This figure is in the latter category, thankfully. Sauron is an "energy vampire," an adversary of the X-Men who feeds off of the energy of living beings. 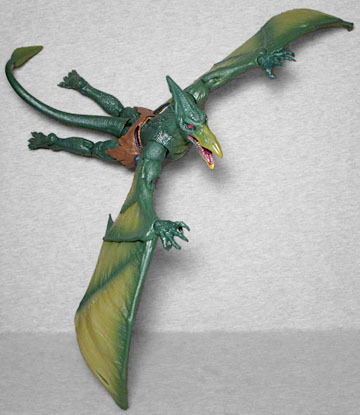 He also turns into a giant were-Pteranodon, which is much more interesting. My first exposure to Sauron beyond trading cards was his appearance in X-Force as a member of Toad's new Brotherhood of Evil Mutants, despite the fact that Sauron is not, in fact, a mutant. It wasn't his finest hour, but you really can't go wrong with a giant pterosaur man, so I absolutely love him and here we are. Sauron is a Build-A-Figure, and to get him you'll need to buy all the figures in Deadpool Legends Series 2 (two DPs and Lady DP), as well as a few stalwarts of the '90s era X-Men (Bishop and Omega Red), and Wolverine (the mutant formerly known as X-23). Sauron is a big honkin' figure. He stands nearly 8½" tall, and his massive wings stretch over 14" wide. There's a lot of detail packed into all that plastic, and he looks quite imposing and impressive. As far as accuracy is concerned, Sauron isn't scoring high marks in the scientific department. 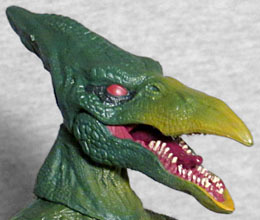 He's got teeth, for one thing, and Pteranodon actually means "winged and toothless." 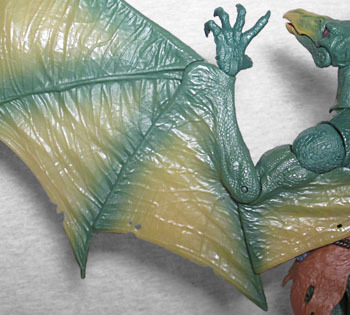 He's also got wings composed of numerous fingers supporting the membrane, like a bat, rather than like a pterosaur, in which only a single finger supports the membrane. His tail is also quite long, which was a feature of smaller pterosaurs, but not Pteranodon. 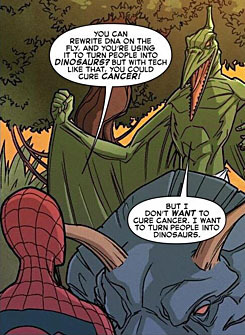 How do we know Sauron is a Pteranodon? His head crest gives it away. Still, none of this dampens my love for this figure even a little bit. While it may not be true to science, it's very true to the character, and covered in scaly, intricate details. 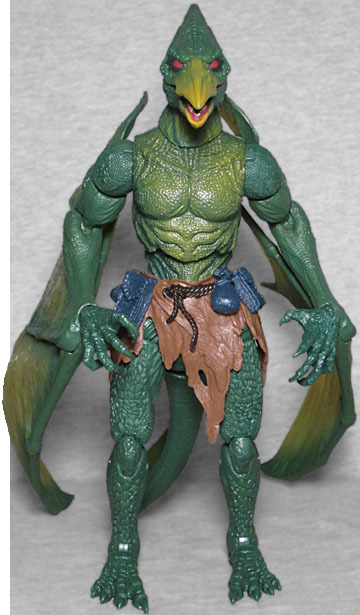 You'd be completely forgiven if you didn't realize that a chunk of this guy is actually lifted straight from Hasbro's Lizard figure from the forgettable Amazing Spider-Man reboot film. Just like when this figure was teased at SDCC three years ago, his torso, upper legs, and shoulders all come courtesy of a figure that's about a half a dozen years old. And it works perfectly! The new parts work seamlessly with the re-used bits, and everything looks amazing, from his expressive yet reptilian head to his veiny, translucent wings. 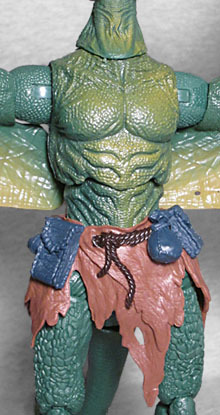 Even his loincloth is packed with detail, including crude stitching on the pouches and a rope belt. The paint is simple, but compliments the awesome sculptural work very well. He's mostly cast in green plastic, and in fact his legs are entirely unpainted, but it's ends up not even being that obvious. The sculpt does a lot of work here, with the deep textures eschewing the need for a wash or dry brush to bring the details out. But there are some nice painterly touches. The head is done extremely well, with some dark shading around the eyes to give them a sunken look, and a yellow tip to his beak. The inside of his mouth is awesome, with painted teeth and a glossy tongue. His chest gets some yellowish highlights, and the translucent areas of his wings are also a yellow green, almost with some orange warmness to them that looks fantastic, especially with some light behind it. His loincloth is brown, with blue pouches and a darker brown for the rope belt. Articulation is great as well, with a ton of points that all work together to give you a lot of posing options. The hinged jaw is a necessity for Sauron, and his works wonderfully. The balljointed neck allows for a lot of expressiveness, and a peg and hinge at the base of the neck lets you tilt his head back for flight poses. His arms feature peg and hinge shoulders, peg biceps, hinged elbows, peg and hinge wrists, and a hinged wing joint. 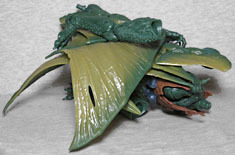 All of these allow you to fold or spread out the wings in ways that look natural and allow for lots of variety. Beyond the wings, he's got a balljointed chest, peg and hinge hips, peg thighs, double hinged knees, and peg and hinge ankles. His tail also features a peg and hinge at the base that allows you to raise and twist it. Sauron doesn't come with any accessories, but there's nothing he really needs. He's a very substantial figure and doesn't leave you feeling like he's lacking anything. I remember his early ToyBiz figure came with a cartoony caveman club, which I always thought was gratuitous, silly, and just an accessory for accessory's sake. Trust me, this figure needs nothing to enhance its presence. It's hard to overstate just how floored I am by this toy. 2018 has been a pretty great year for toys, and it's no small praise to say that this figure stands atop the pile as my favorite for the year thus far.